Are you preparing for your dream wedding or special event and want to make a BIG impression on your big day! THIS DELUXE PACKAGE INCLUDES TWO SEPHRA ELITE FOUNTAINS + MILK CHOCOLATE + WHITE CHOCOLATE + DARK CHOCOLATE + DIPPING SKEWERS - ALL FOR A FRACTION OF THE COST OF JUST ONE COMMERCIAL CHOCOLATE FOUNTAIN!! These Sephra fountains are small enough to take with you to any gathering, but they are sure to make a big impression! Similar to the Sephra Commercial Fountains, but on a smaller scale. Rent them separately or together! Use both fountains to create an unforgettable display, with two different fondues - this will be talked about for months!! QUESTION: What are the differences between the Sephra Classic 18" and the Sephra Elite 19" chocolate fountains? The Sephra Elite offers a REMOVABLE bowl for easy cleaning! The Sephra Classic has a fused bowl. The Sephra Elite offers FOUR temperature settings (high, medium, low & no heat). The Sephra Classic has two heat setting (medium & no heat). The Sephra Elite offers electronic push-button controls. The Sephra Classic has two plastic control knobs. The Sephra Elite is 19 inches tall. The Sephra Classic is 18 inches tall. QUESTION: Are you an authorized Sephra dealer? QUESTION: Can these be shipped to a PO Box or FPO/APO address? ANSWER: No, because this item ships via Fedex, we must have a physical street address for delivery. QUESTION: Can these be shipped to Canada? ANSWER: Yes, this item is available for shipment to Canada for $150.00 (not including taxes, duty or import fees). Please contact us toll-free at 1-877-313-0200 ext 1 to place your order. 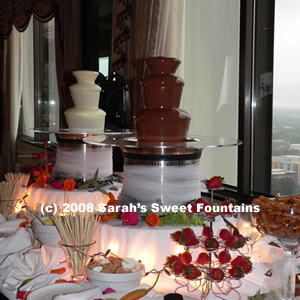 Ensure your next event is a SWEET success with a SEPHRA chocolate fondue fountain!